OverviewJust got back from a 3,300 mile trip pulling a 5th wheel trailer and wanted to update you on the performance and mpg on my new 2011 F-250 6.2L. Trip was from Phoenix AZ to Branson MO. and back. Fuel was regular but it ranged from 86 to 88 octane depending on state. That was interesting to see this as I usually see 87. The engine pulled with no problems on flats as well as hills. I did have many long hills with 6% grade on this trip. I also had headwinds which killed most of my readings. All readings are hand calculated. My average highway speed was 65 mph and took it up to 70 mph when conditions were good. Best mpg was in Oklahoma with 10.4 mpg. flat and no wind and very light on the pedal. Average was 9.2 MPG and the feew tanks with 9.8 mpg and 10.4 mpg brought that up. I can not say enough about the new 6 speed transmission especially on the hill climbing. It handled them with ease and even had a few moments when I had to get down into 3rd gear because I was n't watching and lost my rpm's. 5th or 6th until the top of the hill. Many times with headwind it kicked down to 5th gear and even 4th when climbing. I now have 4,500 miles on the truck and will conntinue to use it for pulling my 5th wheel and hope the mpg will get a little better as time goes on. I do plan on changing my oil and filter next week. I have attached my spreadsheet showing mileage pulling as well as weather and wind conditions. The Regular gas varied Octane ratings and many places has 10% ethonol. I saw 86,87 and 88 octanes so this may have had some direct relations to the mpg. The octane ratings for regular-grade fuel range from 85 to 87, midgrades are rated 88 to 90, and 91 and higher is premium. Last edited by Iggy_AZ; 05-24-2011 at 11:50 PM. According to a recent article, drivers are complaining of reduced gas mileage in the two months since switch to gasoline blended with 10% ethanol. According to the Ethanol Promotion and Information council, most drivers using a 10% ethanol-blended gas will experience a 1-2% drop in mileage. But some drivers are claiming that their mileage has dropped by 25-30%. First, the primary job of the Environmental Protection Agency is, dare it be said, to protect our environment. Yet using ethanol actually creates more smog than using regular gas, and the EPA's own attorneys had to admit that fact in front of the justices presiding over the Third Circuit Court of Appeals in 1995 (API v. EPA). Second, truly independent studies on ethanol, such as those written by Tad Patzek of Berkeley and David Pimentel of Cornell, show that ethanol is a net energy loser. Other studies suggest there is a small net energy gain from it. Third, all fuels laced with ethanol reduce the vehicle's fuel efficiency, and the E85 blend drops gas mileage between 30% and 40%, depending on whether you use the EPA's fuel mileage standards (fueleconomy.gov) or those of the Dept. of Energy. Fourth, forget what biofuels have done to the price of foodstuffs worldwide over the past three years; the science seems to suggest that using ethanol increases global warming emissions over the use of straight gasoline. Just these issues should have kept ethanol from being brought back for its fourth run in American history. Don't let anybody mislead you: The new push to get a 15% ethanol mandate out of Washington is simply to restore profitability to a failed industry. Only this time around those promoting more ethanol in our gas say there's no scientific proof that adding more ethanol will damage vehicles or small gas-powered engines. With that statement they've gone from shilling the public to outright falsehoods, because ethanol-laced gasoline is already destroying engines across the country in ever larger numbers. Just following along. MPG reports for 6.2L are an improvement. Compared to my old 1988 F250 HD SC 8ft bed 4X4 460CID (7.3L) f.i. 5 sd. manual w/od. 373 final ratio. 87 oct. Solo consistent avg 11 1/2 mpg.(avg. 65 mph) Maxed out GVWR (OH slide in camper) best of conditions..8/8 1/2 mpg. Iggy...I agree. Our fuel pumped in from calif. Sometime ago when mtbe was banned here we got the 10% ethanol blend. Immediately lost 1 to 1 1/2 mpg on my small V6 Buick & also slight power loss. Can only imagine how bad 15% will be if change made. MTBE turned out bad for enviroment, but cheaper to produce. Ethanol cost more, less mpg etc. Certain food products price has risen since then (& continue) & can only go higher if 15% ethanol becomes new standard. Just sayin. btw...so far no apparent mechanical problem I can detect with 10% ethanol blend, but 15% blend, hmmmm? I just returned from a 800 mile vacation to MN loaded with a heavy truck camper pulling a boat; averaged 8.0 mpg; with traveling against the wind, the truck often shifted down to 4th gear. Iggy keep drinking that coolaide! yah e85 will drop your mileage a bit. but we have noticed a bit more hp. I would take it over foreign oil any day of the week. its all who you want to support big oil or the american farmer trying to survive in an environment where he is always made out to be the bad guy. Im not for ethanol being subsidised, the less government has their hands in the better in my opinion. just my two cents. Ordered on 2/14 ..... 2011 F-350 6.7 ccsb FX4 lariat vermillion red with black interior 3.55 elockers with 20'' wheels. The wait is killing me slowly! Ordered 2/14 Picked up 4/8 B&W, 2.5 leveling kit, luverne side entry steps, and luverne molded splash gaurds, and lots of CHROME! I have a F350 CC SB 4WD with 4.30's that I just received on Tuesday afternoon. So far I have 700 miles on it and I am loving it. My average fuel mileage since picking up the truck at the dealer is 14.1 mpg combined. My best on the highway with a light quartering tailwind is 14.8 mpg. Average on the highway on a 310 mile round trip today was 14.5 indicated and 14.4 actual. Around town the mileage is averaging just under what I see on the highway overall with engine shutdowns and stop and go light to light traffic mixed in with express ways at 45 mph. BTW I set my cruise at 68 mph on the highway. SO, what's the consensus on the 4.30 versus 3.73 when it comes to mileage? How much WORSE is the 4.10 really? 4.10 is not a ratio available in a SD Pickup. A 4.10 ratio is only available in a Chassis cab SD powered with the 6.7L Diesel motor. The 4.30's seem to do as good or better in town than the 3.73's. On the hwy the 3.73's get about 1 mpg better than the 4.30's on average. These are approximate of course. I am just going off of reports from others posting in forums as every truck and every driver vary. Here are some photos and a rundown of my F-250 on it 's 1st birthday from delivery. (Note the aggregate fuel mileage of 12.99 miles per gallon, and this is a 4.30 final drive truck, unladen weight of 6,532 pounds). I ordered it because the dealer did not have the truck exactly as I wanted it on the lot. 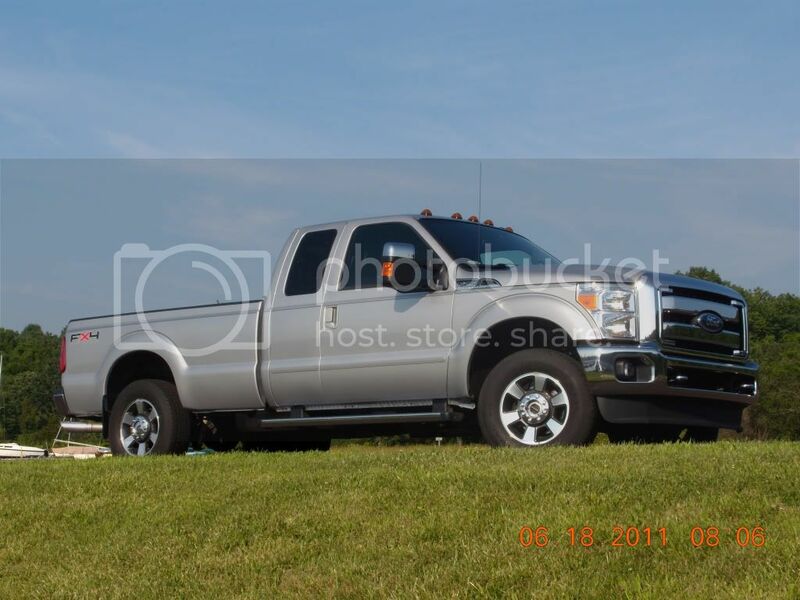 (Not to big of a jump on this as you can get this thing so many different ways) It's a F-250 Lariat SC, FX4, NAV Package, 6.2 gasser with 4.30 final drive. It's my personal use truck, I tow my boat with it, not much other "heavy" use. Hardly any long haul stuff, mostly "local" driving. 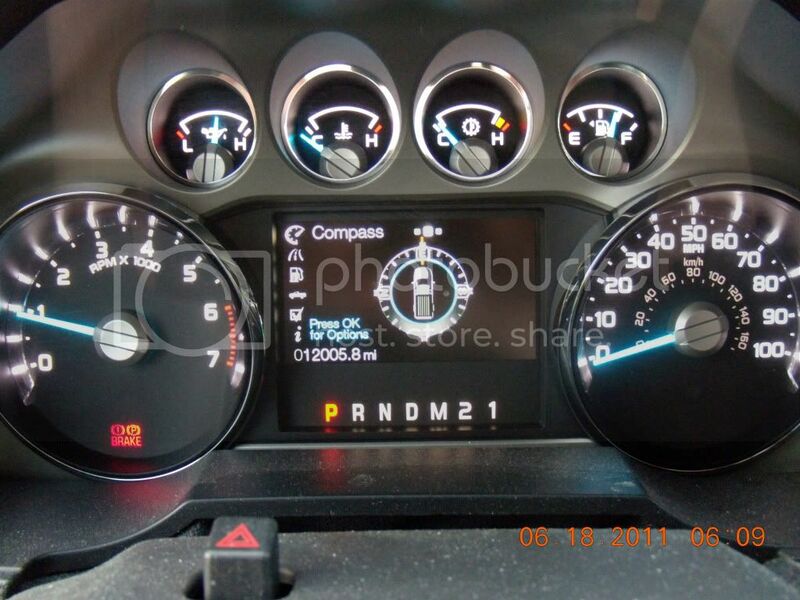 I picked the 6.2 because of the cost of the diesel, and with the 4:30 gears it easily handle's my tow requirements. I am running AMSOIL SAE 0W-20 Signature Series 100% Synthetic Motor Oil, it has had normal service, (1) PA State Inspection and (2) tire rotations. It does not require PA State Emissions Testing because it is licensed as a weight class 3 truck. No maintenance issues, it's been perfect. As of this morning, the odometer reads 12,005.8 miles, (it had 5.6 miles on it at delivery). To date I have put 924.46 gallons of 87 octane fuel it it. To record an aggregate fuel consumption of 12.99 miles per gallon over the last year. That's summer, winter, sleet, snow and towing use. To sum it up, I am very happy with it. Ordered on Friday, 30 April, 2010. I have the same truck in a 6.4L diesel if yours is a DRW. My best empty MPG is 12.5 highway and 10 in town. I am thinking of trading! After 35K miles I average 14.9 MPG. Not much towing, 50% HWY and 50% in town. 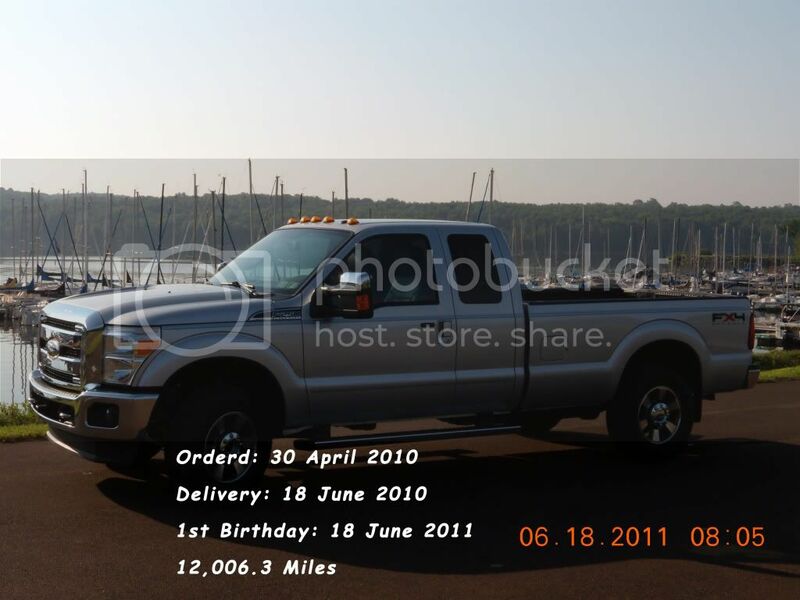 Mine is a SRW...My last truck was an 09 6.4 that got about the same mileage as this truck in town and about 2 mpg more hwy. Last edited by Super08; 06-19-2011 at 08:24 AM. 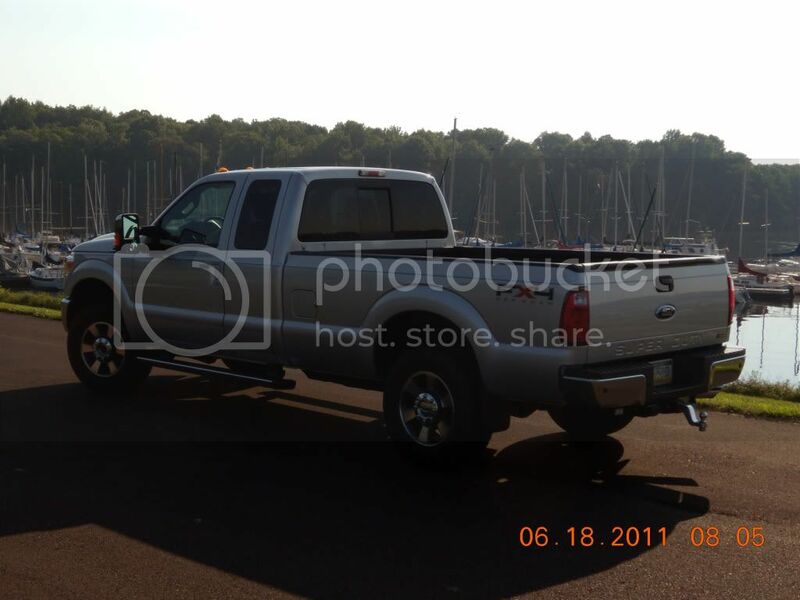 Super08, How would you compare the towing difference between the diesel and the 6.2 gasser?